‘Everyone lives by selling something.’ That’s a quote from Robert Louis Stevenson. But many sales people need to up their game, so in this Brand Blog, I’ll share three important points about selling in today’s marketplace. 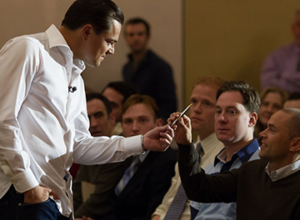 If you’ve watched The Wolf of Wall Street, you’ll remember at the end of the movie how Leonardo DiCaprio moves along a line of salesmen and demands, ‘Sell me this pen.’ Such a direct approach to selling as this may have worked in the days of door-to-door tradesmen peddling their wares. But today, customers are more savvy, have multiple choices and probably know a lot about your product or service prior to you contacting them, thanks to the Internet. 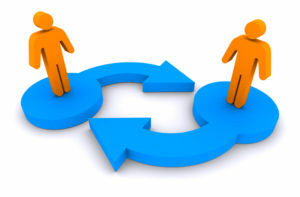 Studies show that buyers are often 60% through a buying cycle before engaging with a sales person. So how do we arrive at the stage where you get the sale more often? In order to do that, we need to use psychology – not scripts, clever closes, handling objections, or nonsensical selling formulas such as AIDA (Attention, Interest, Desire, Action) – something dreamed up in 1898, would you believe! Let’s look at three main characteristics of a successful sale. It doesn’t matter whether you are in retail, business-to-business, conducting face-to-face selling, cold calling or emailing prospects. You can’t begin to understand what buyers are looking for if you don’t know who they are. No product or service is suitable for everyone. You must define your target audience. Many salespeople identify a group, such as generic betting shop visitors for example, or by industry-specific job titles. The problem is, ‘visitors’ could be anyone. And job titles are often misleading in terms of their authority to purchase. You need to research your target audience more deeply, finding out as much as you can about them. For B2C selling, what are their age groups, hobbies, interests? How did existing customers buy from you or your company? Draw a purchasing journey to determine what other actions, besides you making the sale, took place. For B2B sales, what is a prospective buyer’s role, responsibilities and accountabilities? Who else is involved in the sale? What is their buying procedure? Again, map a typical customer buying journey. 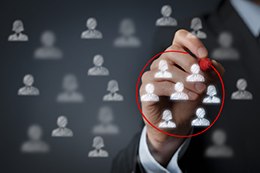 Whether selling to B2C or B2B audiences, we have several ways of identifying who our ideal customers are. Use Facebook, LinkedIn and Twitter to engage in conversations with likely purchasers and build a strong purchaser profile. But don’t try to sell. You’re after information that will help you make the sale later, away from the social media arena. In addition to online services, check local newspapers, company press releases and annual reports – anything relevant that will get you closer to the ideal buyer. 2. 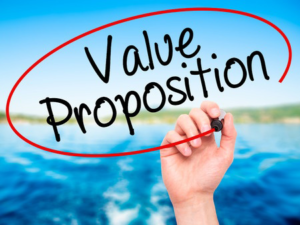 What is your value proposition? And I don’t mean the rational, logical, technical proposition. Essentially, you need to define what the your potential customer. This is different to selling by focusing on tangible features and benefits, or typically price comparisons. They do nothing for the potential buyer’s own emotional satisfaction. Sales representatives are often told to find out ‘what keeps customers awake at night?’ or ‘what is their pain?’ In 37 years of teaching, coaching and consulting in the sales and marketing professions, I’ve never met anyone who has experienced ‘pain’ because of a lack of buying things, either at work or home. And as far as I know, they’ve all had a good night’s sleep too. Yet, again, this is the kind of nonsense that holds back many sales people from getting more buyers to say ‘yes’. What you should be looking for is how the customer will feel when he or she purchases your product or service. For example, will it be confidence – knowing the buying decision was made based on the level of value you have offered? That means you’ll need to sell more than just the article itself. You will need to be perceived as someone who can provide knowledge, information, help – all vital elements that go towards generating confidence for the buyer. A quick search on the web will reveal how many different emotions it’s possible to address. Choose just one, and build your value proposition around it. 3. Understand the power of persuasion. Reciprocity: This is the concept that people feel obliged to give back to others whatever form of a behaviour or service that they have received first. Giving free trials of products, providing important information and research, or offering advice on a problem being faced is a great way to employ this ‘give to get’ principle. Social Proof: When emotionally uncertain, buyers will often look to the actions and behaviours of others to help make their own decisions. A consensus of those who were delighted after purchasing your product or service works well in securing a sale. So make sure you provide testimonials, endorsements and other forms of social proof to ‘answer’ any buying hesitation. Scarcity: Our brains are wired in such a way that we often want more of those things we can have less of. When selling, it’s not enough to focus on the tangible benefits they’ll be getting. Talk about what they stand to lose if they fail to purchase from you. If you’re in retail, let them know what they’ll miss out on once sales or stock items are gone. For industrial companies, see what the implications are of missing out on your products. And remember, address the emotional consequences, not just the rational ones. Of course, there are many other aspects to improving sales performance. But the above points are vital, yet often missing from typical sales processes. If you – or your sales team – are still using the old approaches to selling, such as ‘Always Be Closing’, then you need me more than you know. This isn’t a Wolf on Wall Street ‘Sell Me This Pen’ era. It’s the 21st century for goodness sake! Over the last fifty years buying has undergone major changes, and in this 21st century using sales ideas concocted in the 1800s just won’t work anymore. But knowing who you want as a customer, providing great emotional value in addition to the rational features and benefits you’re offering, and using psychology to address emotional needs means you could be selling a great deal more in 2019. Even if your product is a pen.